For over two centuries, Beethoven's sonatas have probably been the most desired concert pieces. Almost every serious pianist has been striving to master the entire sonatas cycle. It may be hard to believe but it is a confirmed fact that since Beethoven's death very few pianists have dared to perform the complete cycle of 32 sonatas at major international concert venues. 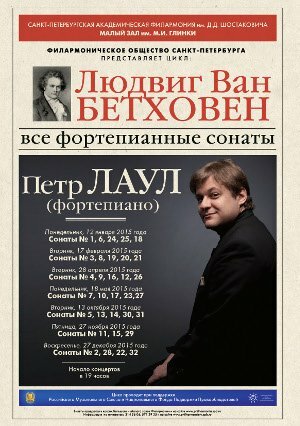 Some of them include the renowned soviet pianists Maria Grinberg and Tatiana Nikolayeva, Hungarian pianist Annie Fischer, Austrian pianists Artur Schnabel, Alfred Brendel, Friedrich Gulda, Wilhelm Kempff and Rudolf Buchbinder, Chilean pianist Claudio Arrau, German pianist Wilhelm Backhaus, American pianist Daniel Barenboim and our compatriot Vladimir Ashkenazi. Unfortunately, Walter Gieseking (Germany), Emil Gilels (USSR) and Rudolf Serkin (USA) left this world before they could finish recording the cycle. The proposed cycle of seven concerts performed by St. Petersburg pianist Peter Laul is a true act of artistic courage demonstrated by the young performer. We have all reasons to believe that this event will not only set a new milestone in the history of the concert life of St. Petersburg, but will become one of the brightest concert events in Russia.